Dehai News -- AfricanArguments.org: Ethiopia’s ruling coalition used to be known for its unity. Not anymore. AfricanArguments.org: Ethiopia’s ruling coalition used to be known for its unity. Not anymore. The four parties that make up the ruling EPRDF used to all follow the party line. Now their internal disagreements are out in the open. What is the future of the EPRDF, Ethiopia’s ruling coalition? Credit: SarahTz. In the past three years – and most acutely since Prime Minister Abiy Ahmed took office in March – Ethiopians have witnessed something unusual in their country’s politics. The constituent parties of the ruling coalition have been openly disagreeing with one other. The governing Ethiopian Peoples’ Revolutionary Democratic Front (EPRDF) has long been renowned for its secrecy and centralism. Since coming to power in 1991, its decisions have typically been made in supposedly freewheeling internal debates, which the coalition’s four parties have then obeyed closely. But this seemed to change as protests grew a few years ago and economic challenges piled up. A striking early example of this was the July 2016 rally in Gondar, Amhara region, over the alleged annexation of the Wokait area by Tigray state. The protest, which was highly critical of the Tigrayan People’s Liberation Front (TPLF), appeared to have been facilitated by elements of the Amhara National Democratic Movement (ANDM). The TPLF and ANDM are both members of the ruling coalition. Early this year, Amhara’s ruling party exhibited combative posturing once again. 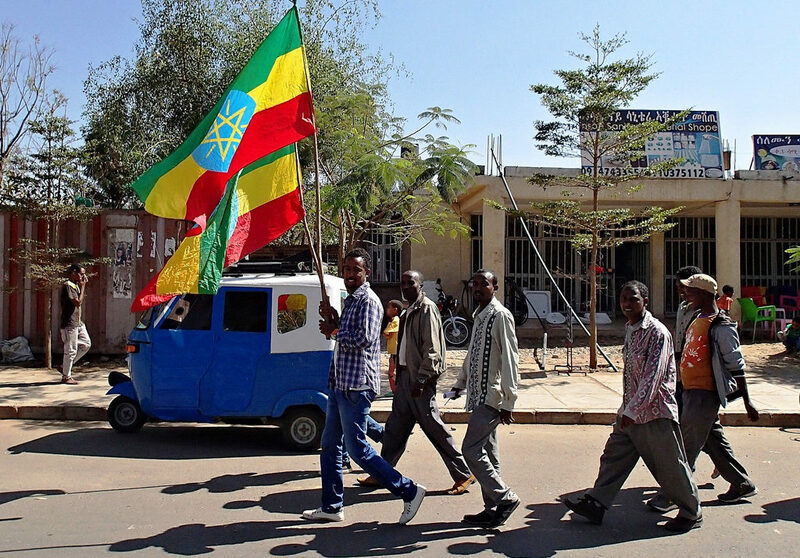 In Bahir Dar, regional president Gedu Andargachew and party boss Demeke Mekonnen oversaw a rally in which the old Ethiopian flag, a once-banned political symbol, was on brazen display and former prisoners were paraded. Two of the EPRDF’s parties have also changed their names recently in another sign of their newfound autonomy. The Oromo People’s Democratic Organisation (OPDO), led by Prime Minister Abiy, officially became the Oromo Democratic Party (ODP) last month. Meanwhile, the ANDM followed suit soon after to become the Amhara Democratic Party (ADP). The ADP has been particularly outspoken in asserting its views. It has said publicly that it wants to redraw administrative boundaries and has pushed for a Sudanese border agreement to be re-examined. The party has even hinted that it wants to discard the EPRDF’s ideology of “revolutionary democracy”, an alternative to the liberal model that emphasises mass participation. Previously, such opinions would be closely guarded behind the coalition’s united front. In another sign of shifting dynamics, some parties with the EPRDF have also been flirting with strangers. In its home region, the ADP, for instance, is under pressure from the National Movement of Amhara. This newly-formed party is gaining popularity by appealing to those who believe the Amhara region was exploited under the previous TPLF-led government and now faces the threat of being subservient to an ODP-led administration under Abiy. The ADP has responded to this challenge by giving airtime to ethnonationalist voices on the television and radio stations it controls. For their part, some Oromo activists – including presumably in the ODP – are looking for potential allies in the Southern Nations state by supporting the Sidama quest for their own region. Meanwhile, TPLF-friendly actors are looking for potential allies in Oromia regional state. They are pushing for alliances with the ethnonationalist wing of the ODP and even with the previously-banned Oromo Liberation Front (OLF). This is apparently part of a strategy to bolster support for Ethiopia’s system of ethnic federalism against demands from those calling for a more “unitary” system. With the unity of EPRDF fraying, its parties are also looking to regions not directly represented in the coalition. When the federal government ousted the head of the Somali regional state in July, for instance, the ruling coalition’s constituent parties responded differently. The TPLF tacitly condemned the military intervention, while the ADP made a statement seemingly supporting the move. The types of disagreements brewing within the EPRDF are of course common in multiparty democracies. Internal disputes within coalitions are also not new to Ethiopia. After the 2005 election, the opposition coalition tore itself apart over whether or not to take up its parliamentary seats. The key difference, however, is that the EPRDF and allied parties are in government. Not only that. They control every single elected position across the vast nation, from the millions of kebele council seats up to the premiership. The issue of its unity therefore has far-reaching consequences. The question is whether Ethiopia can manage coalition politics without the country’s already fraying political fabric unravelling. Furthermore, can Abiy’s administration implement reforms in time for local elections in 2019 and parliamentary polls in 2020? The public’s trust in government organs is low and Ethiopia has little experience of competitive multiparty politics. Ethiopia today is traversing uncharted political ground. This inevitably means there will be some dangerous pitfalls and unintended consequences. For example, Abiy’s government has welcomed back former rivals such as Ginbot 7 and the OLF – something many thought was never possible – but this has raised various thorny questions such as over what to do with the armed wings of returned political movements. Amidst Ethiopia’s ongoing fast-paced change, it is hard to gauge where it is all heading. Despite more open discourse, there is no clarity yet on whether this new era will see an end to the EPRDF’s monopoly on power, or even perhaps its dissolution. What is clear though is that, for better or worse, Ethiopia is veering towards a new form of coalition politics defined not by quiet obeisance but by open political competition.